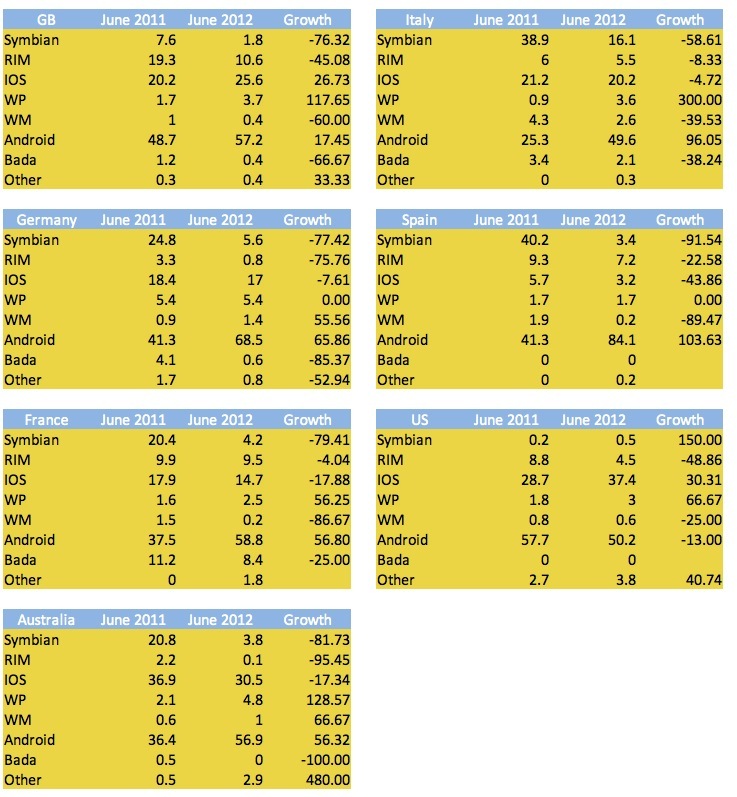 Techcrunch reports on an analysis from Kantar Worldpanel ComTech on mobile device sales on some key markets. The newer entrant, Microsoft’s Windows Phone is showing positive signs, in that its percentage of sales is growing in different markets, but it remains in the single digits, and will be hard-pressed to make inroads in the short term with Android device makers continuing to perform so well. I’ve modified their table to include percentage growths. For some reason, the original tables showed W7 and Windows Mobile. .
I’m finding the UK results quite surprising. 117% growth since this time last year for WP – the largest percentage of growth in comparison. Now of course it’s easy to get large percentage changes when you play with small numbers, but given the dire situation at MS/NOK, even any slight growth can’t be taken for granted. RIM, Bada from these tables show negative growth. 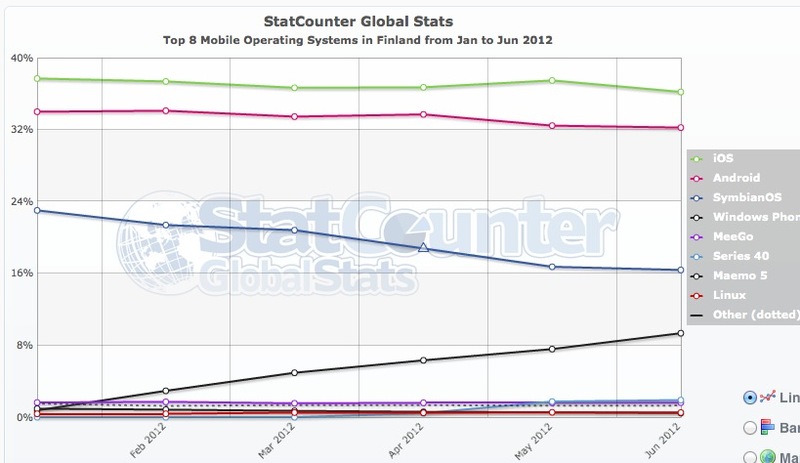 Symbian shows some growth in USA. 150% Growth. But that’s based on moving from 0.3 to 0.5% only. WP is the only one that does not have negative growth (either zero growth or positive growth). On the whole, WP shows most growth. Android pretty much at least half of these markets. 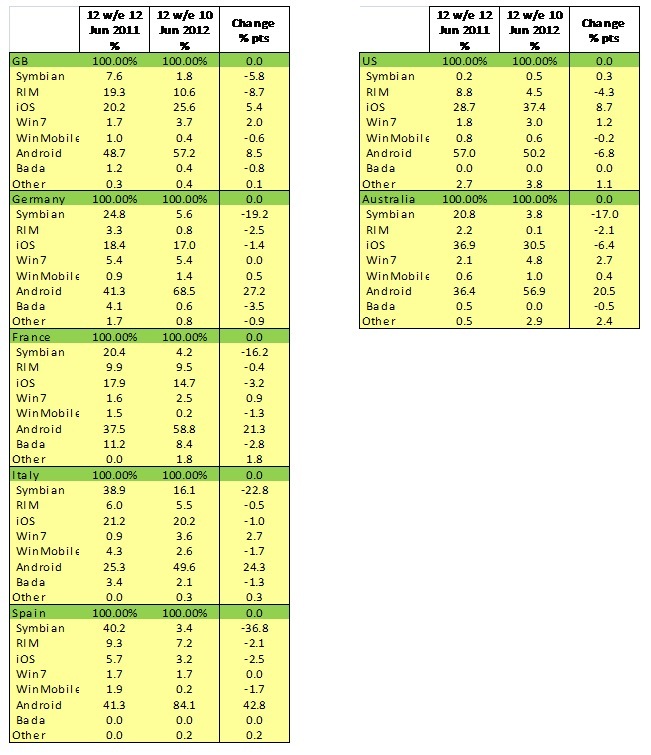 Kantar’s numbers indicate the sales numbers whilst in comparison, statcounter shows browser activity across the whole market (new sales and all existing handsets in use). That’s why in statcounter market share extrapolations, we might see 1.08%, equivalent to 3.7% in terms of sales for the UK (Kantar). For the usual context, Finland is a small country – population of only 5M. A large percentage is encouraging but would only convey more relief were we to see it in multiple/larger markets. China, for instance, the biggest mobile market, has a population of 1.4 BILLION. It shows up 0.56% for WP (constant, slow and steady growth though). Very tiny percentage but potentially more WP sales than Finland. With no new products on show but continuing threats from opposition, times will be tough for WP/Nokia Lumia until WP8 devices arrive. Even then, WP8 is no guarantee of success for MS/Nokia. Should WP8 catch on, Nokia still find themselves in a difficult fight on the WP turf with HTC and Samsung. Let me stick on my hat of hope again. Things may look dire but there’s still a glimmer of hope that everything falling in to place makes sense for Nokia in the long run. Cheers spacemodel for the tip.